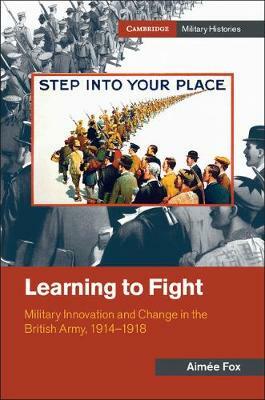 Learning, innovation and adaptation are not concepts that we necessarily associate with the British army of the First World War. Yet the need to learn from mistakes, to exploit new opportunities and to adapt to complex situations are enduring and timeless. This revealing work is the first institutional examination of the army's process for learning during the First World War. Drawing on organisational learning and management theories, Aimée Fox critiques existing approaches to military learning in wartime. Focused around a series of case studies, the book ranges across multiple operational theatres and positions the army within a broader context in terms of its relationships with allies and civilians to reveal that learning was more complex and thoroughgoing than initially thought. It grapples with the army's failings and shortcomings, explores its successes and acknowledges the inherent difficulties of learning in a desperate and lethally competitive environment.